We’ve already posted here that we have been developing a browser extension. Finally, we can share the results with you! We call it Waves Keeper, because it allows you to hold your WAVES keys securely while interacting safely with third-party web resources. 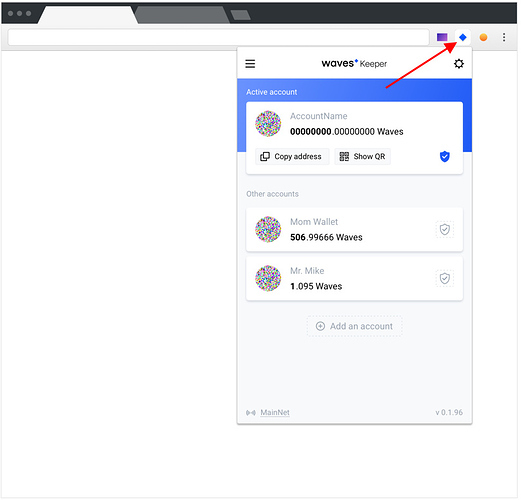 This is a kind of Simple Authentication and SSO for dApps or Waves-enabled web applications, and enables you to sign transactions without entering your private key or password. Your seed is held securely within the extension and cannot be accessed by outside apps, keeping your funds safe from malicious sites. Now I am excited to announce a Waves Keeper beta version for testing and feedback. We are planning to release it on the Google Chrome Store next month. If you are building your own application, you can use this API to work with Waves Keeper. Please take a few minutes to fill out this survey (there are just a few short questions) so we can continue to update and refine to the Waves Keeper. Thank you for your feedback! Great job, works very well on my machine! one suggestion: may be add a scroll bar instead of a button that confirms deletion of all accounts? This way a user would have to consciously make an effort to delete the account and the possibility of an accidental confirming click could be excluded may be could even be a snake bar, not a slider. 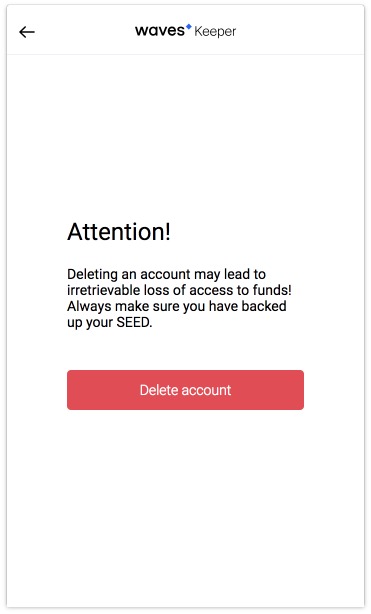 It should require a password to confirm deleting an account. Unfortunately, Google does not allow installing extensions from anywhere except its store (for Windows users ). Until we add our application there you can install the unpacked application. Не могу понять, в чем проблема. Кто-нибудь может помочь? Будет ли версия для Firefox? Привет. В данный момент мы тестируем и дорабатываем плагин под chrome. Когда он будет стабилен, будем его дорабатывать под другие браузеры. Авторизацию доработали файлики скоро выложим. Надо будет переустановить плагин и перезагрузить демо страничку. Я сам пытался найти, где же закралась ошибка, но, к сожалению, не смог. А вот с примером Waves.signTransaction какая-то беда. Both versions of Waves Keeper have been updated (.crx and unpacked), please let us know if you are still facing that issue. Can Linux users try this beta version? Only for MacOS and Windows? I couldn’t install it on Mac. Chrome says - Apps, extensions and user scripts cannot be added from this website. I’m a new Mac user though, I might be doing something wrong. I can now add the extension to Chrome however I can’t seem to enable it. The enable button does not work for me. I use Windows 10 on my desktop. I used the unpacked version and this one works, thanks! Will you also be adding the send Waves and tokens functionality like Metamask? Awesome job anyway, looks great. Thanks. I got it from “windows package”. Waves Keeper worked well on Chromium browser of Linux. I’ve created a simple tx-based chat - Waves Wall. You can try waves keeper there. great job, love it Tenya !